Wikipedia Edit-A-Thon Day to add Women in Audio into Wikipedia. 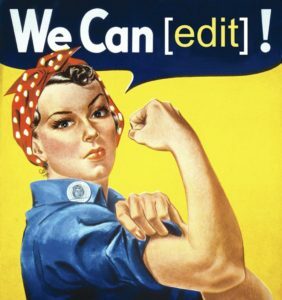 Please join us online May 26th for information, instructions, and help to add Women in Audio to Wikipedia. Nicole Kirch and April Tucker have been very active in this important project and will be online to assist and answer questions. In the meantime – you can review the page Nicole has made Women in Audio and read her fantastic blogs with step by step instructions. Why is editing a Wikipedia article so important? First of all, Wikipedia is the modern equivalent of an encyclopedia; it is the first stop in finding an answer. With over 5.6 million articles in the English language, it is one of the most comprehensive collections of knowledge available. Currently, there are very few female Wikipedia editors and a very small percentage of female-related articles. SoundGirls is looking to change that by training new Wikipedia editors. Wikipedia was made to be edited by the public, and it can be another tool to grow the influence of women in audio and to break the glass fader.